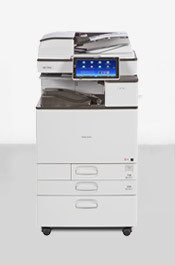 Lease, rent or buy Ricoh Office Printers at some of the lowest prices available on the web. Maine Plc offers you the complete range of Ricoh IMC Office Printers All Models. We are passionate about service and we never forget the simple business rule - customers pay wages. 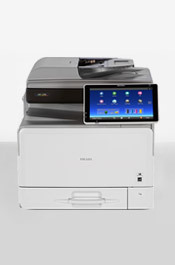 This A3 colour multifunction printer offers outstanding performance to streamline workflow and increase productivity. Colour A4 copies and prints are generated at 20 a minute. 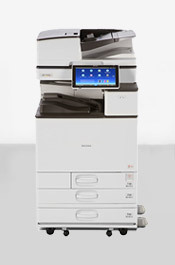 As a fully featured all in one colour MFP the C2500 offers exceptional performance. With the option to use paper up to A3 in size, documents can be produced with trim marks on paper up to 300gsm in weight. The Ricoh IM C3000 model offers superb reliability, output quality and workplace productivity – so no matter what you are printing this Ricoh scanner printer is the perfect device for your high output, multipurpose environment. The Ricoh MPC307SP is able to print or copy 30 A4 pages a minute in black and white or colour, makes the Ricoh MPC307SP MFP the right choice for workgroups needing fast document throughput. The Ricoh IM C3500 model offers superb reliability, output quality and workplace productivity – so no matter what you are printing this Ricoh scanner printer is the perfect device for your high output, multipurpose environment. The Ricoh IM C4500 model offers superb reliability, output quality and workplace productivity – so no matter what you are printing this Ricoh scanner printer is the perfect device for your high output, multipurpose environment. The Ricoh IM C5500 model offers superb reliability, output quality and workplace productivity – so no matter what you are printing this Ricoh scanner printer is the perfect device for your high output, multipurpose environment. ©2019 Maine Business Systems PLC. All rights reserved. All trademarks remain property of their respective holders, and are used only to directly describe the products being sold or serviced. Their use in no way indicates any relationship between Maine Business Systems and the holders of said trademarks.